It’s a known fact on this blog how we love our idlis and dosas for breakfast at home. Often, I end up making South Indian style coconut chutney or my mom’s peanut chutney to go as a side dish for our breakfast. It does get monotonous at times and that’s when I prepare my MIL’s popular onion tomato chutney. 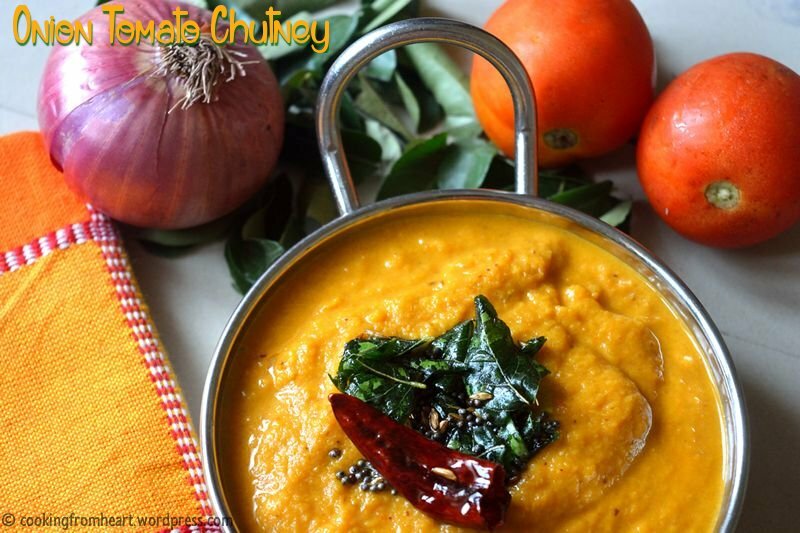 It’s tangy, it’s spicy, it’s colorful, it’s vibrant, it’s tasty and it really goes well with any South Indian breakfast. The best part is that this chutney can stay good for at least three to four days when stored in an air tight container in the fridge and comes as a life saver when you are super busy in the mornings or pressed for time during the evenings. 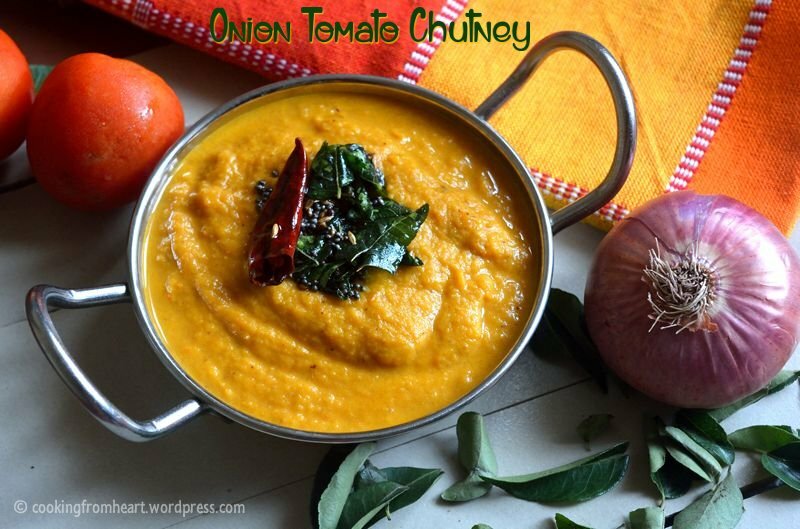 The ratio of onions to tomatoes in this recipe is usually 1:3 and that’s why this chutney ends up being a bit tangy, perfect for soft idlis or crispy dosas. My MIL usually adds green chillies to this chutney unlike the most onion-tomato chutney recipes and I feel I like this taste better. There is also a hint of garlic, but that is optional. The secret ingredient to this chutney is a tbsp of grated coconut or a small chunk of fresh coconut and it just takes this recipe to a whole new level – adding a great texture to it. 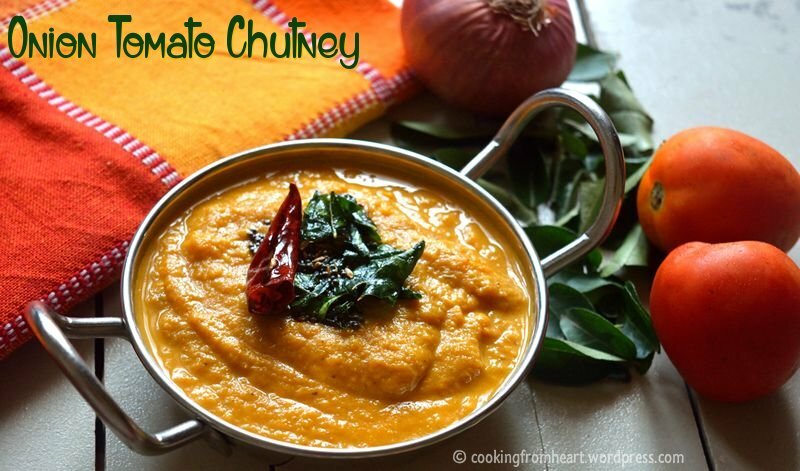 It is really easy to prepare this chutney and you would need only a tsp of oil to make a whole bowl of chutney – making it totally guilt free. Start by roughly chopping the onion and tomatoes. In a pan, heat ½ tsp of oil. Add Fennel seeds and as they splutter, add chopped onion and tomato pieces. Add peeled garlic pods, roughly chopped green chillies and the small marble sized ball of tamarind. Add required salt and mix well. Reduce the flame to low and keep the pan covered with a lid. The tomatoes should leave enough water to cook everything. It should take about 5-7 mins, the water should be evaporated and the onion-tomatoes should look cooked. Let the mixture cool for 5 mins. In a mixer jar, add the onion tomato mixture along with grated coconut. Blend into a smooth paste. Add some water if required. Remove it on to a bowl. In a small pan, heat ½ tsp of oil. Add mustard seeds, jeera and red chilly (cut in half). When the mustard seeds and jeera splutter, add washed curry leaves. Fry for ten seconds. Add the tempering on top of chutney. Serve as a side dish or idli or dosa. The number of green chillies can be adjusted according to the taste preferences. As the chutney turns out tangy, I add two of the spicier version of chillies. Adding grated coconut is optional but just a tbsp of it makes a lot of difference to the taste and is highly recommended. If the onion-tomato mix is sticking too much to the bottom while cooking, sprinkle some water. The chutney stays good in the refrigerator for 3-4 days. Tamarind gives a tangy punch to the chutney, if you don’t like the tanginess – can skip it. 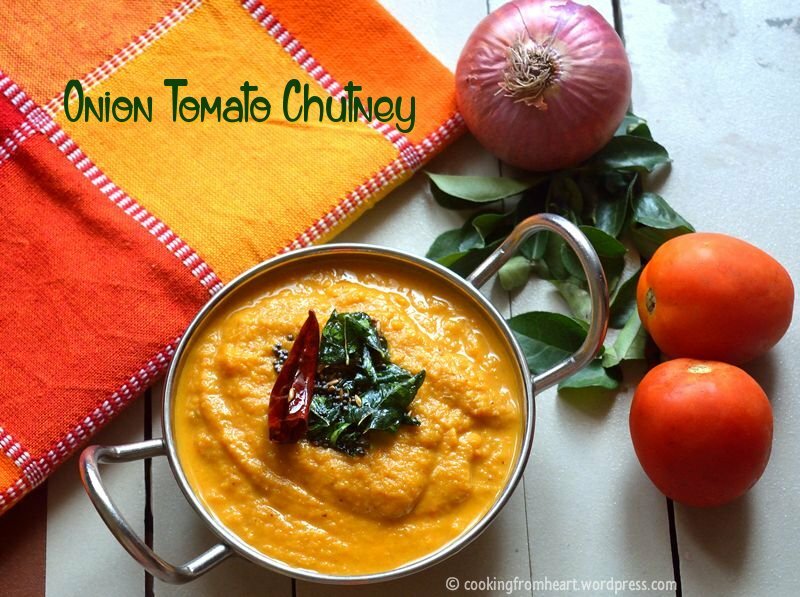 This looks perfect.. My tamilian neighbour makes just awesome onion tomato chutney.. thats why I never make it as she is there ? I just finished dinner but this is making me crave for dosai and chutney now ? 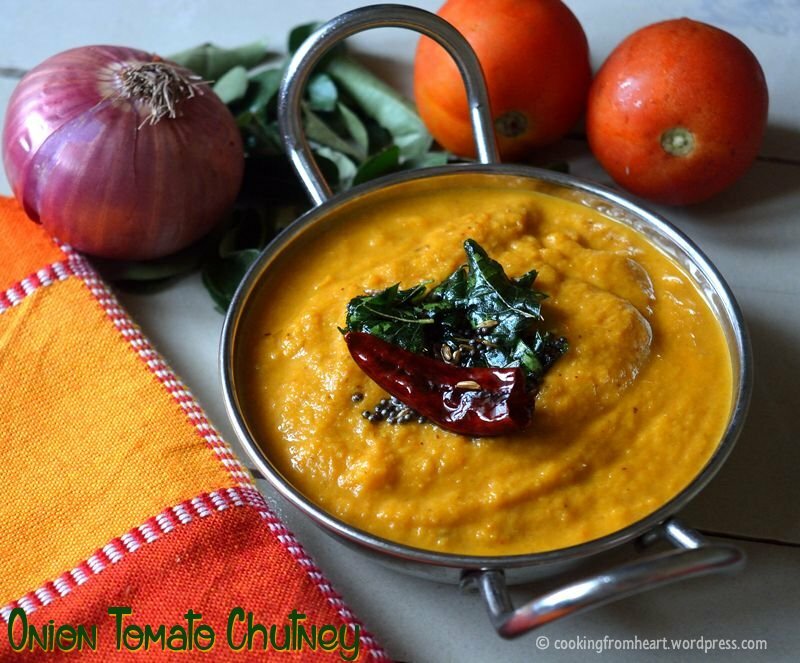 I love tomato chutney. But the the one with tomatoes and onion is pretty new to me. Looks delicious! Bookmarked! I made it and it was absolutely yummy!